This is where all of the magic happens: all of our NY style pizzas are listed here on our pizza menu page! We also have all of the good treats you expect out of a pizza shop: drinks, subs, sides, and desserts too. We know that there is numerous pizza places that you could choose to eat at, so our pizza menu is the most important section of our website. If you are ready to discover the best pizza in Colorado Springs, simply open the different tabs on this page to learn more about our food, especially our different crust types and specialty pizzas. We have a great selection of soft drinks and beer from Bristol Brewing, your Colorado Springs local brewery! Green Chili NY Style Pizza! For a Limited Time – Try the new local favorite! Spicy, fresh, green chili over bubbling cheeses and hot marinara sauce. Pairs nicely with a crisp, cold beer. Mama-Mia, that’s a spicy dish! When you order pizza from Joey’s Pizza, we want you to have as many options as possible. You can enjoy your lunch here in our pizza restaurant, or you can choose our pick up and take out option. You can also place an online pizza order through our website portal. Have your pizza delivered right to your door! Toppings: $1.29 each for 14 inch and $1.79 for 18 inch. Square, thick pan pizza. Toppings: $1.79 each. 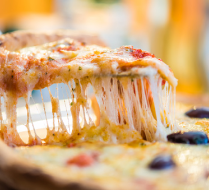 The biggest Cheese Pizza you’ve ever sunk your teeth into…24 inches (2 FEET)! Additional toppings $2.25 each. Don’t have time to eat your delicious pie now? We make it for you to take & bake at home. Toppings: $1.29 each for 13 inch and $1.79 each for 17 inch. Pepperoni, sausage, meatball, bacon, green peppers, red onions, black olives, green olives, jalapenos, mushrooms, tomatoes, garlic, pineapple, extra cheese, anchovies, chicken, artichoke hearts, eggplant, ricotta, roasted red peppers, basil, provolone, banana peppers, bacon & Genoa salami. Sausage, green peppers, & red onions. Green peppers, red onions, mushrooms & black olives. Ricotta, mozzarella & Parmesan cheeses dressed with garlic oil. Pepperoni, sausage, meatball, Canadian bacon & chicken. Chicken, pepperoni, jalapenos & garlic. Eggplant, ricotta, Canadian bacon & Parmesan. Our famous garlic knots baked on the crust & served with a side of fresh marinara sauce for dipping. Chicken, hot sauce, ranch & mozzarella cheese. Chicken, BBQ sauce, red onion & mozzarella cheese. Sliced roma tomatoes, fresh mozzarella, basil, garlic, fresh marinara sauce & Parmesan. Chicken, tomato, garlic, basil, light tomato sauce, & provolone cheese dressed with garlic oil & parmesan. 16×16 – thin crust Sicilian style with basil, mozzarella cheese, fresh marinara sauce, oregano & Parmesan. Loaded with handfuls of delicious bacon topped with melted provolone cheese. Chopped clams, garlic and bacon topped with melted provolone cheese, basil and Parmesan. Ricotta, Mozzarella, & Parmesan cheese. Served with a side of our homemade marinara sauce. Choose up to 3 toppings rolled & baked with fresh marinara sauce & Mozzarella cheese. Served with a side of our homemade marinara sauce. Ham, Genoa salami, pepperoni, & Provolone. Served with a side of our homemade marinara sauce. 8 pieces. Pepperoni, Mozzarella & Parmesan rolled in fresh dough & baked. Served with a side of our homemade marinara sauce. Genoa salami, pepperoni, ham, provolone, Roma tomatoes, romaine lettuce and roasted red peppers served with homemade honey balsamic dressing. Lightly breaded chicken breast mixed with homemade marinara sauce topped with melted mozzarella cheese. 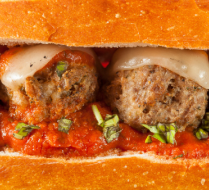 Meatballs mixed with homemade marinara sauce topped with melted provolone cheese. Lightly breaded eggplant mixed with homemade marinara sauce topped with melted mozzarella cheese. Sliced sausage, green peppers & red onions mixed with homemade marinara sauce topped with provolone cheese. Fresh romaine lettuce, roma tomatoes, & red onions. Fresh romaine lettuce, croutons, & parmesan cheese. Genoa salami, pepperoni, ham & provolone cheese topped with artichoke hearts, black olives, roasted red peppers, & mozzarella cheese. Fresh romaine lettuce, mushrooms, roma tomatoes, red onions, green peppers, & pepperoni topped with mozzarella cheese. Barq’s Root Beer, Cherry Coke, Fanta, Dr. Pepper, Sprite, Coke, Diet Coke. Bottles: Blue Moon, Corona, Bud light, Coors, Redds, Angry Orchard, Sam Adams, Fat Tire. Local Beer: Bristol Brewery, Laughing Lab, Beehive, Red Rocket, Mass Transit, Compass IPA. Bite-size dough knots sprinkled with powdered sugar & side of chocolate dipping sauce – 10 pieces. Fresh made local, Award winning New York Style Cheese cake!